LEADER Worldwide Chauffeured Services provides Kansas City limo and shuttle services that take the hassle out of organizing your meeting & event transportation. We provide not just transportation, but peace of mind with our Duty of Care Promise. Each client receives unparalleled, personal service that makes our car service standout. No matter the event, coordinating travel plans can be tricky. Because the timing of air travel can be unpredictable; Delays, cancellations, and missed flights can be problematic. From the moment you hire LEADER Worldwide, you have a team member who serves as your personal contact and coordinator. We not only make the planning of your event easier, we will take the hassle out of the billing, customizing the process to fit the needs of your company. Our dispatch team is experienced with last minute changes, so our professionally trained & PAX Certified chauffeur arrives exactly when your clients and guests need their transportation. 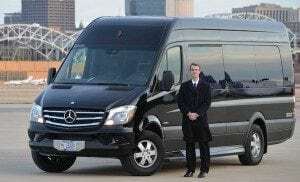 The ground transportation for your event is your first impression, LEADER will put YOUR best foot forward. The safeguards we use to ensure the quality and service our customers expect will make LEADER’s car service your favorite source for reliable transportation. Our dispatch team confirms travel multiple times, helps plan and coordinate travel, and tracks flights. We also have a brand new fleet of Sedans & SUVs, as well as Executive and Limo Style Mercedes-Benz Sprinters to meet the needs of your clients, staff, and guests. Our round-the-clock reservation policy is available every day of the year, and we can customize billing to work best for your organization. Planning an event or meeting can be challenging and overwhelming. Let LEADER Worldwide Chauffeured service make travel plans effortless, so you can focus on making your function spectacular. Trust LEADER Worldwide with your Tour Needs Call or Click to book your group event today!